The CAGED System for guitar is a method for understanding the fretboard by dividing it into five overlapping chunks. Its name is derived from the five basic major open chords: C, A, G, E, and D. (I’ll explain why they’re in that order later.) The idea is that each of those five open chords uses a layout of notes that can be freed from open position and moved to any other fret on the neck. Barre chords are a perfect example of moveable open chord shapes. The shape of the E open chord is the basis for every barre chord with a 6th string root. Likewise, the A open chord yields root-5 barre chords. The CAGED System, however, goes far beyond this. Know how to find a note everywhere on the fretboard. It doesn’t need to be instantaneous, but you should be familiar enough with octave patterns that you can identify all the Fs on the guitar, for instance. It might help to just memorize every note on the guitar. It would help to know a few scales, perhaps some pentatonic or blues scales, some major scale shapes, whatever. All of this should be familiar so far. But there’s one detail that you’ll need to add to the way you see open and barre chords: Keep track of the roots. Note the circled notes in the diagrams above. Those are the roots. You already know to follow the root on the 6th or 5th string to find barre chords, but you’ll need to be aware of the others at all times as well. I chose to move each shape to the seventh fret just for illustration purposes. The whole point of the CAGED System is that all these shapes can be moved around at will, to any fret you like. The C shape has roots on strings 2 and 5, two frets apart. The A shape has roots on strings 5 and 3, two frets apart. The G shape has roots on strings 3, 6, and 1, three frets apart. The E shape has roots on strings 6, 1, and 4, two frets apart. The D shape has roots on strings 4 and 2, three frets apart. While it’s named for the five open major chords, the real framework of the CAGED System is not open chords or major chords; it’s the root layout above. As long as you keep the root layout in mind, you can apply any concept you want to a given CAGED position: minor pentatonic scale, Dorian scale, sus4 chord, diminished arpeggio, anything. All you have to do is keep track of the roots and know how to construct the concept you’re after. I’ll demonstrate with the most fundamental element in all of music theory, the C major scale. (Read why the major scale is at the heart of music theory.) The C major scale contains the notes C, D, E, F, G, A, B. Did you notice the order of the shape names as they ascended the neck? C-A-G-E-D! Also notice that each position overlaps with the previous position and the next position. Any single note can usually be found in two different positions relative to a given root. Keep in mind, all these shapes are movable. If you need a D major scale, for instance, anywhere on the neck, you can move one of the above shapes up two frets. One more time! Let’s switch to a different root and a different kind of scale: G minor pentatonic. So now that you (hopefully) understand what the CAGED System is, what do you do with it? I suggest starting with what you already know and looking at how it fits into this system. 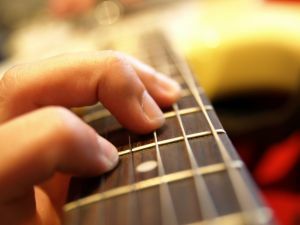 If you’ve learned any scales or arpeggios, figure out which CAGED position they use, and see if you can find other positions around the fretboard. Remember, with every note you play, you’re always in one of these CAGED positions, it’s just a matter of choosing to visualize the guitar neck that way. Also review the songs, riffs, and licks you already know. Chances are, they’ll fit nicely into one or two of these CAGED positions. You’ll find that lots of guitar parts shift between the different positions. The ultimate goal in using this system is to understand the fretboard so well that you don’t have to think about positions anymore. To get there, you’ll need to love each position like your own child, like you had quintuplets. Each one is unique, with various advantages and annoyances, but you’ll never choose favorites.